Lateral femoral cutaneous nerve supplies the skin of the lateral thigh. 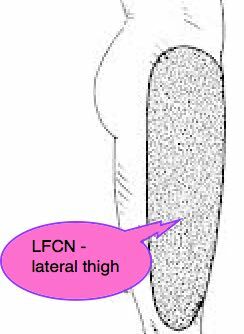 Lateral femoral cutaneous nerve is a tiny slip coming from the upper lumbar spine and supplying the skin only on the side and perhaps front of the thigh in the groin area. It has no motor component and when pinched cannot cause weakness of any muscles. Predominantly it causes a numb feeling, and sometimes a burning pain on the side of the thigh. 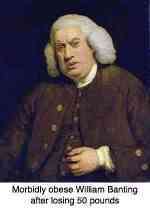 It is the nerve affected by a condition called meralgia paresthetica that causes much grief occasionally. There is no recognised treatment, though the chiropractic management of MP is very effective. 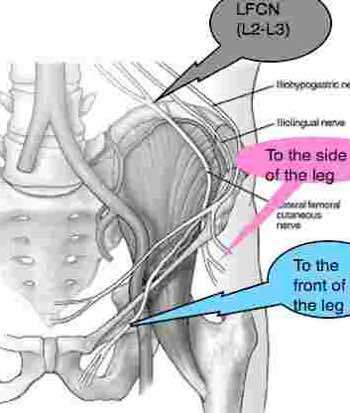 The lateral femoral cutaneous nerve arises from the L2 and 3 lumbar roots. It emerges from the outer border of the psoas muscle, which is not shown, which then joins with the the iliacus, seen in the graphic above forming the iliopsoas muscle complex. The nerve then proceeds obliquely across the pelvis, toward the so called anterior supererior iliac spine, a hard lump of bone about six inches above and slightly forwards from the hip bone. Notice how the iliacus, with the psoas, courses down with its tendon inserting into to the femur in the upper thigh. These muscles, together called the iliopsoas, are in part responsible for the intense tenderness in the groin that may accompany the numbness in these syndromes. a posterior branch which pierces another muscle called the tensor fascia lata, not shown, and passes backward across the lateral and posterior surfaces of the thigh, supplying the skin from the level of the greater trochanter to the middle of the thigh. The result is that lower back and upper leg pain can present with a myriad of signs and symptoms, with many different etiologies (causes). Meralgia paresthetica causes sensory changes on the side of the thigh where there may be a burning feeling, or numbness along the distribution of the lateral femoral cutaneous nerve. It has no motor fibres so when pinched cannot affect the quadriceps muscle; the knee won't give. If it does, then one suspects an entirely different problem. The knee tends to give on the stairs with a profound limp being the giveaway; read about it at femoral nerve damage. A pinched lateral femoral cutaneous nerve never causes weakness of the quadriceps muscles, nor does it affect the reflex. Lateral femoral cutaneous nerve is a small slither belonging with its larger brother the femoral nerve. Because it courses through the abdomen it can be affected by a psoas abscess, though I confess I've never seen such a case; such folk are really sick and will normally find their way through the medical portal. Because it lies close to the small intestine, colon, kidney and appendix, and the spine, amongst others, infection of these organs can spread to the psoas muscle with subsequent irritation of the lateral femoral cutaneous nerve. Psoas abscess is a rare condition, with less than 20 cases per year world wide and many are either HIV positive or IV drug users. These are not a chiropractic case obviously though in South Africa with the soaring HIV pandemic, one could stumble into our clinics. The lateral femoral cutaneous nerve, like the median nerve in the arm causing carpal tunnel syndrome, is often involved in a so-called "double crush" syndrome. Successful treatment must address the spinal subluxation and where the LFCN courses under the inguinal ligament in the groin. Interestingly it passes in the upper leg over the sartorious muscle and is perhaps the reason why the inner thigh is often extremely tender in these cases. One of the reasons that chiropractic is so successful is that we really try to find and treat the cause of your symptoms. But in the case of an irritated lateral femoral cutaneous nerve, both the pinch in the groin and the subluxation of the spinal segment have to be addressed. Medicine tends to treat only the groin, and straight chiropractic just the spine; neither will probably be successful in treating meralgia paresthetica; both must be considered, as in carpal tunnel syndrome, another double crush syndrome in the arm. Is walking a risk for thigh numbness?